I was on Ohgishima Island (in 1994) looking at underground natural gas tanks the next time I saw the Tsurumi Tsubasa Bridge. The name means 'flying into the future' and it was suggested by the public. The bridge has a 510 m (1675 ft) main span and 255 m (837 ft) side spans. The towers open to carry the superstructure and then close to carry a single vertical plane of cables. This tower shape has become very popular for both single and double planes of cables. This bridge may still have the longest main span for a single plane of cables. However, it strikes me that the superstructure is less stable, especially for wind and seismic loads. That may be why the Tsurumi Tsubasa Bridge has special dampers and an orthotropic deck. 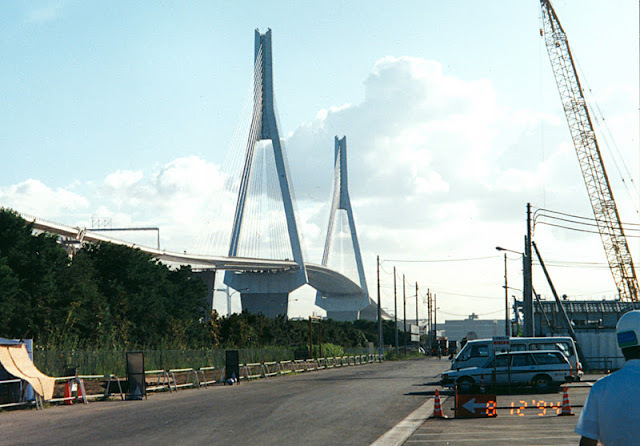 Cable-stayed bridges have filled a gap between arch or cantilever bridges and the longer suspension bridges. However, they have had problems such as corrosion of the cables, vibration of the cables, etc. Also, they are difficult to build and usually require an engineer to design their construction. Tokyo Bay Bridges: Tsurumi Tsubasa Bridge (2) by Mark Yashinsky is licensed under a Creative Commons Attribution-NonCommercial-ShareAlike 3.0 United States License.